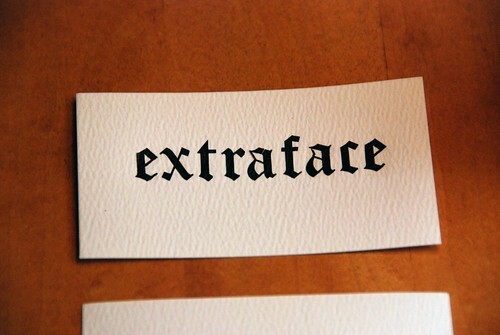 Posted byDave Coustan	 April 8, 2008 April 8, 2008 6 Comments on Extraface Wins SXSWCards Business Card Competition! I’m very pleased to have taken home first prize in Joshua Strebel’s SXSW Business Cards Competition. My handmade, DIY card got more votes than those of some of the most talented and best-known designers and creatives. Heh, nothing has changed; these people will continue to be the ones you should look to when you are looking for fantastic design. I’m thrilled to now be able to call myself an “award-winning designer who is not a designer”, and I don’t see myself giving Jason Santa Maria a run for his money any time soon. In fact, as I write this I’m now one of the happy users who is a beneficiary of his great recent work on the WordPress 2.5 redesign, and I hope to have the good fortune to work on a project with him some day. 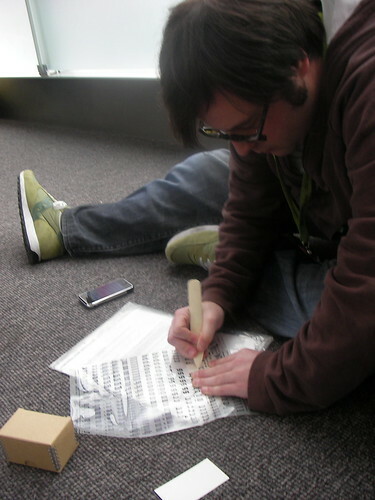 I explained the whole story of why and how I made my 2008 SXSW cards previously on Extraface. Special thanks to Joshua Strebel for building and hosting the competition, and everyone who voted and tweeted their support for my now award-winning design :) I guess it’s time to fire up the bone folder and make some more of these for ROFLCon. Very cool. I’ve clicked and read the links so got the whole story. Excellent. I always knew you had it in you Dave – Dave Van Gogh, has a nice ring to it…. make a card with an ant on it next.